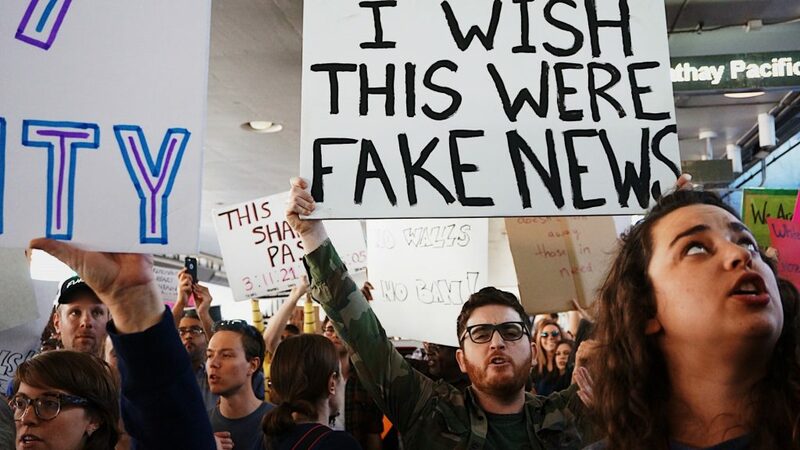 During the 2016 American presidential election, but especially after the victory of Donald J. Trump, the term fake news became part of the public lexicon. The confluence of social media, digital campaigns, and the monetization of internet ‘clicks’ led to numerous instances of groups outright fabricating news stories, either to serve ideological objectives, or even just to generate high web traffic and income. And while such falsifications were more likely to emanate from the Trump/Republican side of the equation, Clinton/Democratic partisans were not innocent from the use of—or belief in—fake news that confirmed their ideological biases. And in a time where Trump is president, Democratic Party partisans, according to some, have become increasingly vulnerable to recirculating fake news stories. But as important as first-rate journalism is to the health of democratic society, so are multiple disciplines within the academy. Specifically, the work of historians offers much of value in terms of textual analysis, a critical eye to how sources are created, preserved, and hierarchized, and a wider context that tends to complicate societal ‘common senses’ that underwrite much of our current fake news climate. Indeed, since Trump’s win many have argued that history and related scholarly disciplines are core tools to preserve the sanctity of truth within education and mass media. And while historians need not pat themselves on the back too vigorously, the role we can play in providing viable information—even without definitive answers—is a vindication of the humanities in our times. But perhaps the greater role historians can play in this moment revolves less in our ability to quash fake news through our supposed mastery of archival research, and more in the contextualization of the very idea of fake news. Simply put, fake news in its 2017 iteration poses some unique challenges, but should in no way be treated as an unprecedented phenomenon. As a piece in the New Yorker—a source claiming that it is “fighting fake stories with real ones”—has noted, the existence of fake news has a sustained history. This is where our work as historians has its greatest importance: in our various temporal, thematic, and geographic sub-disciplines, we can all offer a sense of how the media of the day often purposefully warped the truth in the search of ideological or financial objectives. We can illuminate how fraudulent stories were used not simply to win elections or sell papers, but to promote war, trumpet state propaganda, mislead consumers, and justify systems of colonialism and oppression. And while I don’t believe historians need take a nihilistic approach to this issue by stating in glib terms that ‘all news is fake,’ there is certainly a value in historical criticism challenging the idea that ‘reputable sources’ like those mentioned above are the arbiters of truth, rationality, and impartiality within our media landscape. Indeed, those sources have their own financial and ideological motivations that—even if subconsciously—could lead to news limited in its ability to represent the multi-dimensional nature of truth. And while this obviously isn’t fake news in the ‘Obama is a Kenyan Muslim’ vein, we must show how officialdom’s objectives and perspectives cannot be the saviour from our current predicament, especially if those sources in aggregate represent interests that are dominant and homogenous in social and economic terms. Ultimately, Historians have a chief role to play in helping people better question where there news comes from, and how to verify and interpret that news. This can certainly chip away at the blatant fake news that has helped define 2017, but it also asks of society tough questions about how the media more broadly represents the truth, especially when it clashes with its interests. It should likewise implore historians themselves to explore the structural and intellectual biases that perpetuate certain practices within the discipline, regardless of truth. After all, Fake History is by no means a non-issue, and the politics of what gets to be venerated as historically-meaningful is rife with biases and structural power imbalances. If we are looking for the roots of our present-day political crises, fake news is certainly part of the problem, but we need to take an equally critical lens to the real news and the politicians, civil servants, and opinion makers that mislead the public through their conceptions of history and uses for the past. What we need in Canada – and more globally – is not just an assault on the so-called “fake news” but rather a return to critical analysis in the media and a better understanding of the work of the historian. Christo Aivalis is a SSHRC Postdoctoral Fellow in the Department of History at the University of Toronto. His dissertation examined Pierre Trudeau’s relationship with organized labour and the CCF-NDP, and is being published with UBC Press in early 2018. His work has appeared in the Canadian Historical Review, Labour/le Travail, This Magazine Our Times Magazine, Ricochet, and Canadian Dimension. He has also served as a contributor to the Canadian Press, Toronto Star, CTV and CBC. His current project is a biography of Canadian labour leader A.R. Mosher. I come at the problem studying the “Days of Action” against the Common Sense Revolution in Ontario during the mid/late 1990s. I also come to the problem strongly subscribing to the observation that journalism is the first draft of history (and by no means the only). It simply follows that the more journalists doing basic reporting, the more material historians have to work with. Researching the mid/late 1990s in Ontario I have drawn upon more than a dozen Ontario newspapers. I can reasonably reconstruct a fairly detailed narrative history of the protest movement against the Harris Tories, from the machinations of the union leadership to the countless protests that erupted across the province. Depending on the movement’s ebb and flow, the newspapers allow me to set a narrative pace that can operate at a weekly or monthly level, right down to a minute by minute account of a police charge against picket lines, or the unfolding of a debate in a big union meeting about going on illegal strike. I have drawn on a number of other sources to flesh out these narratives – interviews, union newsletters, activist publications. However, it is the newspapers which provide historians the ability to actually reconstruct a detailed account based on extensive beat reporting. An example: a mid-sized daily such as the London Free Press was able to produce at least half a dozen original stories each day for the duration of the 5-week OPSEU strike in 1996. For historians, this is a bonanza. Many other Ontario newspapers achieved a similar feat. This is possible because the London Free Press, like most other urban/regional dailies in Ontario, had a labour beat reporter, as well as beat reporters for education, City Hall, healthcare, the courts, and Queen’s Park. Papers with wider regional readerships also had beat reporters dedicated to neighbouring towns and counties, such as the London Free Press’s coverage of St. Thomas/Elgin County, or the Windsor Star’s Essex County reporting, or the Thunder Bay Chronicle-Journal’s wider northwest coverage encompassing Dryden, Kenora, Red Lake, Sioux Falls, etc. On top of all this, other reporters with no dedicated beat were assigned to augment what beat reporters were already doing. Bringing this back to fake news, another process is underway during the same time as the protests against Harris. Conrad Black’s Hollinger bought the Southam chain of newspapers in 1996, which included most of Ontario’s newspapers. He unleashed a rapid process of asset stripping to boost profits despite most of these papers being financially stable and profitable. Newsrooms were gutted and beat reporting was curtailed massively – the labour beat in Ontario’s mainstream papers being wiped out by the end of the decade and most of the labour beat reporters becoming “business reporters” with their labour mandate excised. In addition to asset stripping, workloads for journalists increased while expensive senior beat reporters were either reassigned – and thus squandering their expertise and contacts – or bought out in favour of younger, cheaper, less-experienced reporters. The depth, quality and quantity of reporting was already in dramatic decline in the late 1990s, alienating readers in the process, and all for the sake of a profit-mad ownership greenlighted by governments who remain convinced that large media monopolies are somehow favourable to maintaining a functional newsmedia. Yet this was a process driven to boost profits in an already profitable industry. It was not an attempt to save an industry from the death blow of the internet – as seems to be the common sense understanding now. This is very much the same process that unfolded in the United States beginning in the 1980s, as laid out by media historian Robert McChesney – well before the internet became a serious threat to advertising revenues. Having gutted beat reporting, which was ostensibly objective and comparatively well-rounded and detailed in its coverage of events, our newspapers remain disproportionately filled with opinion columnists and a handful of correspondents whose columns offer their brand of analysis and nothing resembling an attempt at a reporting of events. Newsroom editorial boards are like intelligence agencies without people in the field collecting basic information from which they can formulate a credible assessment of the larger situation. Unmoored from reality for so long, is it any wonder the news is so fake? So, the overtly absurd “fake news” we’ve come to know is merely the maturation of a media denuded of functioning newsrooms and beat reporting that sought to write that first draft of history; drafts no doubt plagued with problems but in their quantity and relative quality offered their readership and now historians a far more useful understanding of the recent or distant past. Thanks so much for the thoughtful and detailed comment here. I think you make fantastic points about how last generation’s shift in the political economic of Canada’s media landscape can’t be put aside when we talk about the limitations of media in our age. Just throwing this out there, but your comment could be a fantastic jumping off point for a piece for Active History, which touches on factors that you have a well-versed experience in given your research into the 1990s.